UPDATED: Wed., Sept. 2, 2015, 2:19 p.m.
Whitworth women’s soccer team members posted this photo online. The university removed it Tuesday. 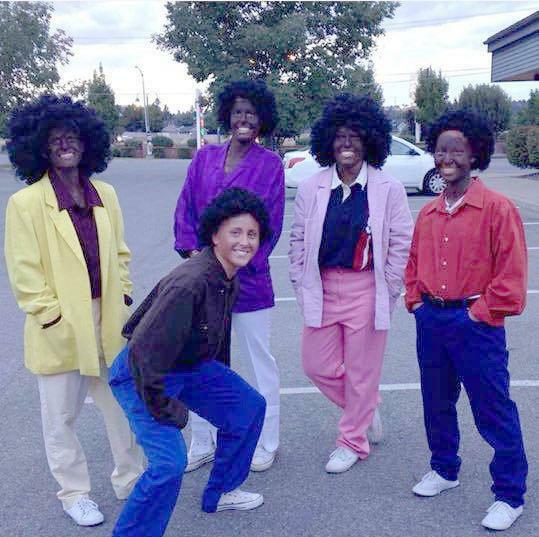 A day after a social media post depicting soccer players wearing blackface at an informal event, Whitworth University suspsended the five players shown in the photograph. Athletic Director Tim Demant and other university officials said Tuesday that they met with all five players, whom they declined to name, and said the players said they were not aware of the racist implications of the use of blackface. The players were attempting to appear as members of The Jackson Five at a local bowling alley. “Obviously, their actions were very unfortunate,” Demant said Tuesday. “But students make dumb decisions without knowing the implications of their decisions. We don’t feel it would do any benefit to anybody” to suspend them. However, he left the final call to coach Jael Hagerott, who decided the suspend the players for today’s opening-season match against Carleton. The Pirates won 2-0. The university is planning no further puntitive action. However, the students will be subject to Whitworth’s normal student-conduct process, according to a university news release. “As a Christ-centered university that believes in the value of all individuals, we are seeking to use this situation as an opportunity to educate, redeem and restore,” Demant said Wednesday in a statement. Published: Sept. 2, 2015, 12:08 p.m. Updated: Sept. 2, 2015, 2:19 p.m.